1. Featuring solid pine. This oversized bedroom will surely make a statement in any home. 2. Multi step nitrocellulose based lacquer finish in a beautiful distressed vintage white finish. 4. Microfiber lined top dresser drawers. Ball bearing metal glides. Magnetic catches on doors. 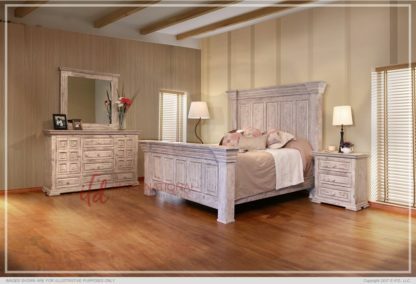 These are just a few quality characteristics that make our Old World Terra Bedroom functional as well as beautiful. 5. Requires box spring.6. Available in Queen Eastern King and California King sizes. 2. Hand applied finish adds special character and makes each piece unique.3. This type of joinery has been used for years in quality furniture making. Ensures stability anddurability on every piece.